Using the correct Stone Benchtop Cleaner is CRITICAL to maintain the shine and ease of cleaning of Caesarstone & Stone benchtops. In fact most people use what they think is correct or even a “STONE BENCHTOP CLEANER”. Consequently these products are made to use on granite. Hence they contain acids, waxes and silicone all damage the shine. Also making the surface harder to keep the stone benchtop clean. No matter the Brand they are made virtually the same way with the same materials. What makes quartz stone benchtops including brands like Caesarstone, Cambria, Silestone etc less susceptible to oil staining etc. Is water absorption or the lack of the product allowing water to be absorbed. Comparatively Granite and Marble have a higher water absorption making it easier to stain with oils etc. Because Granite has an more open structure the the surface and the binding component. Or what holds the stone together are different and are natural type of igneous rocks. Consequently using acids on engineered or quartz stone benchtops are know to damage and VOID ALL WARRANTIES. Once damaged the only way to fix any damage is by one of our technicians. Ultimately we only need to repair the damaged area. With this in mind, waxes do not and can not penetrate the surface or engineered stone or quartz stone benchtop. This also applies to sealers and colour enhancing products. The use of waxes will make the surface dull, not as shiny. Harder to keep clean, hazy when cleaned with cream cleaners, fingerprint, transfer ink from newspapers and be patchy in appearance. These are present in most surface cleaners including the popular brands. The only way to fix these issue is to use a SPECIALISED ENGINEERED OR STONE BENCHTOP CLEANER, we recommend Stone Guys Power Cleaner. After all it is the one that our stone technicians use to clean the stone benchtops prior to doing anything. It is all about the SHINE! Using detergent and hot soapy water just does not work as a modern stone benchtop cleaner. For example with any high gloss or shine products including glass, shower screens or even your car paint finish. Just using soap and water then not rinsing leave detergent deposits. Hence why shower screens go cloudy and why your car paint water marks if not rinse correctly. 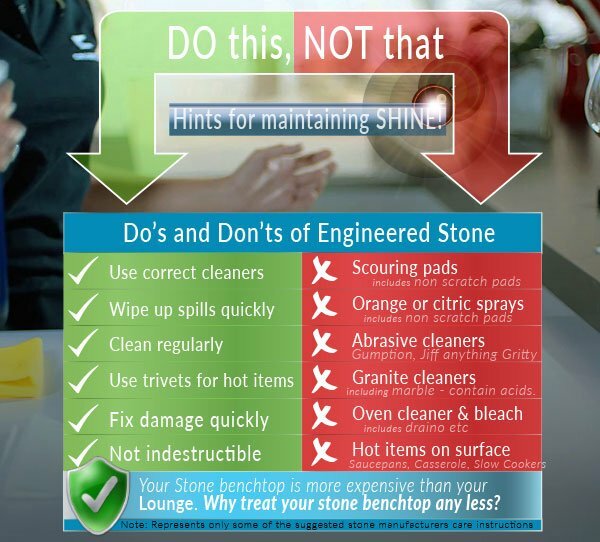 Commonly assumed as a good stone benchtop cleaner method, as a consequence leads to a build up of detergents. Accordingly dulls the surface and leaving streak that also attract dust. Proof is in the feel and look of the surface when correctly cleaned with a specially formulated quartz or engineered stone benchtop cleaner. In any event the true secret is our nanoTECH cleaning clothes. Especially made for quartz and modern stone benchtop surfaces. Incorporating nanotechnology designed fibres to lift contaminates from the surface of quartz stone leaving a perfect shine. Providing long period between cleaning by reducing fingerprinting, streaking, grime and germ transfer or impregnation into the surface. Used in conjunction with Stone Guys Power Cleaner for the ultimate stone benchtop cleaner. Shine, clean and protect. Whilst Stone Guys Power Cleaner is the #1 choice for stone benchtop cleaner for caesarstone, essastone, quantum quartz, cambria etc. Specially designed formula lifts most general stains that others leave behind. Leaving your quartz stone benchtop look better for longer. Give your benchtop the feel test. Should be smooth like a freshly polished car. For tougher stains including water marks, overnight stains, curry stains, colouring in pens, paint. Old coffee or tea stains are easily removed by using a dot of Stone Benchtop Spot & Stain REMOVER. It’s proven lifting power will banish stains leaving a perfect shine. no damage to the shine. NOTE: Physical or Chemical damage are NOT stains. Commonly used by rubbing at the surface, bleach, sodium salt, citric acids, oven cleaner. Please email us if you are unsure. Get in the habit of cleaning your stone benchtops regularly with a specially designed modern quartz stone benchtop cleaner. Granite, marble and stone cleaners are not considered suitable. With a light spray of our stone benchtop cleaner and the nanoTech cloth it takes no time to keep your quartz stone benchtop looking and feeling great. If you spill something on your countertop, clean it up right away! Don’t allow liquid to sit there too long as it may cause discoloration. Called Etching from the chemical reaction it has with the stone surface. Removing these spills and stains as you go reduces the difficulty in removing later on such as food, tea stains , coffee stains etc. Altogether we recommend that you never use any type of scouring pad including non-scratch. Warning: Do not use any product containing window cleaners, bleach, sodium salts, ammonia, citric acid. Including orange based cleaners, caustic based cleaners such as Domestos. Consequently voiding your stone benchtop warranty. Also of importance these chemicals will affect the Stone Benchtop Surface over a period of time. Leaving it dull, causing watermarking problems on the top ( causes by altering the Gloss). Hence making it harder to keep clean. Hint: not sure what your favourite cleaner contains? Enter MSDS after the product name into google, as a result it will give you a list of the toxic or harmful chemicals. Firstly lightly spray an area approximately 1 metre x 1 metre with “Stone Benchtop Power Cleaner” and allow to stand for 10-15 secs. Secondly, wipe the area in a flowing motion with the specially designed nanoTECH cleaning cloth. Especially designed to capture the dirt, grime, bacteria and excess stone benchtop cleaner – “Power Clean”. Repeat for the remaining stone benchtop area. Thirdly use the second especially designed quartz stone benchtop nanoTECH cleaning cloth. Wipe the entire area leaving a perfect shine. clear you modern quartz stone benchtop of all clutter. use two clean nanoTECH cleaning clothes. Do NOT use fabric softeners when washing the nanoTECH clothes. Hint: If you have been using the wrong stone benchtop cleaner it may take a few repeated applications to remove all the build up of contaminants and grime causing streaks. I have an essa stone black bench top that has been exposed to heat and it has discoloured in that area, just wondering if there is anything that can be done. It is only a year old. Hi , we have censer stone kitchen bench tops and are bit discourlored can they be fixed and can we get a estimate please? We live just south of Kiama on the NSW south coast. Our Caesar stone bench is ten years old and very dull. What do we need to do to get it looking like new again? It requires a professional repair from one of two companies worldwide able to restore the original finish. To restore the original finish to the stone, it will need to be repaired professionally. There is only two companies world wide able to do this. No, though any detergent based product will leave a build up of a film on the surface, effetely dulling it over a period of time. Also any citric based or orange power product contain citric acid and it will attack the surface over a period of time. Hi, I have recently bought unit & kitchen bench top cecear stone is dull & some oil mark that can’t remove. How much it cost to polish it area approx 2 mitre by 80 cms. I have super glue and a full section where I’ve tried to remove. Can this be repaired? Yes we can remove it and not damage the surface.